Photograph: Courtesy Julieta Cervantes Hello, Dolly! The secret of Dolly Levi’s success is revealed at the top of Hello, Dolly!’s unstoppable title song. The number is usually recalled as a paean to the star, sung by the adoring waiters of the ritzy Harmonia Gardens Restaurant as she descends a staircase in triumph and a bright red dress. But it begins, tellingly, with Dolly singing to them: “Hello, Harry / Well, hello, Louie…” It’s been years since her last visit, but she remembers them all and greets them by name. No wonder they love her. She makes them feel loved. 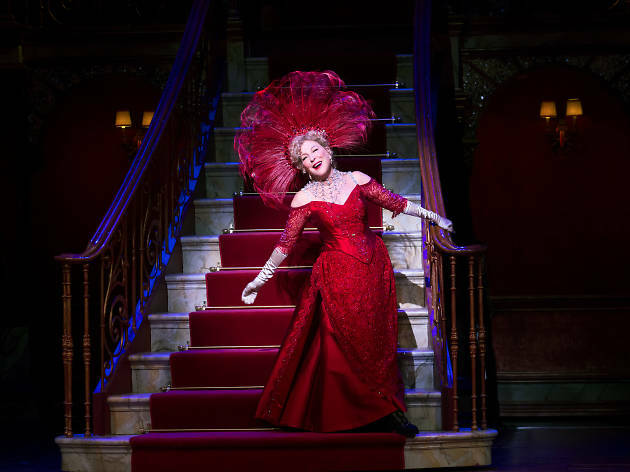 In the musical’s blissful Broadway revival, the same thing happens between Bette Midler and the audience. Midler fans out her performer’s wares with expert self-assurance—she delivers her jokes at a steady vaudevillian clip, like Mae West in a hurry—but she also seems like she couldn’t live without us. And the part of Dolly, a matchmaker in late-19th-century New York, is exquisitely suited to Midler’s enormous warmth, savvy and drive. (She cuts her schmaltz with zest.) It’s hard to imagine a better match of actor and role: It is, in a word, perfection. Adapted by Michael Stewart from a Thornton Wilder comedy, Hello, Dolly! may be a vehicle for its star, but this revival treats it like a vintage Rolls-Royce. From the rousing overture on, everything about the production, directed with joyful aplomb by Jerry Zaks, gleams with old-fashioned charm. David Hyde Pierce brings droll dignity and adorable flashes of cartoon clowning to his performance as Horace Vandergelder, the grumpy Yonkers “half-a-millionaire” whom Dolly is out to snag. Gavin Creel and Kate Baldwin are the winsome secondary couple, and Taylor Trensch and Beanie Feldstein have wonderfully zany moments as their sidekicks. Jennifer Simard makes a meal out of her cameo role as a disastrous date. Hello, Dolly! offers classic musical theater without a hint of apology. Jerry Herman’s exuberant score is a show-tune bonanza, and Warren Carlyle’s choreography distills showbiz dancing to its essence; it elicits grins with simple bounces and kicks, and earns waves of applause with a cakewalk. Midler hasn’t appeared in a Broadway musical in almost 50 years. It was worth the wait. We are all her waiters now. Shubert Theatre (Broadway). Book by Michael Stewart. Music and lyrics by Jerry Herman. Directed by Jerry Zaks. With Bette Midler, David Hyde Pierce, Gavin Creel, Kate Baldwin. Running time: 2hrs 30mins. One intermission. Note: Bernadette Peters assumed the title role, opposite Victor Garber, starting January 20, 2018. 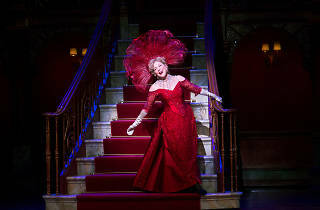 Bette Midler and David Hyde Pierce returned to the production for the final six weeks of its run, starting July 17, with Donna Murphy playing Dolly on Sunday matinees.